Jersey will meet Premiership side Bath for the first time in their history in a pre-season friendly on 23 August. 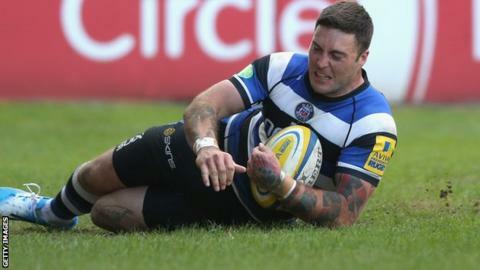 It will mark a first playing return to St Peter for former island player and England international Matt Banahan. Jersey will also host pre-season games with Scottish side Ayr on 16 August and National One's Blackheath on 30 August. "I'm really excited that we can confirm the visit by Bath as the centre-piece of our pre-season fixtures," said Jersey chairman Bill Dempsey. "Having secured our place in next season's Championship, we will be looking to get off to a good start, and testing ourselves against a top side like Bath should prove excellent preparation." Banahan's last game for Jersey was the 2006 Siam Cup win over rivals Guernsey before he moved to the London Irish academy, and Dempsey says the opportunity for him to play on home turf will be a highlight. "We'll be looking forward to seeing Matt Banahan run out at St Peter. When he left the island it didn't seem realistic that he might return with his Premiership team-mates to take on Jersey, so it'll be a memorable occasion when the day comes."